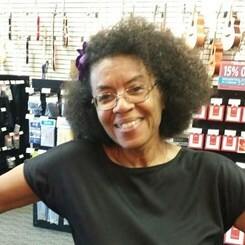 Teaching at the Music & Arts in Oxon Hill on Saturdays, Dr. Lloyd offers piano, flute, and guitar lessons. She is one of the most versatile teachers we have on staff! Dr. Lloyd received a B.S. in Biology from Yale University, and an M.D. from Howard University College of Medicine. She was the music director of Kettering Baptist Church and has spent 10 years as a lead singer, composer and arranger for gospel group “Gideon’s Army”. Dr. Lloyd is currently the music director and lead singer of oldies Rock n’ Roll band “The Regressions” and First Christian Church at Brock Hall. She also has +15 years of teaching experience! Request Lessons with ALLYN today!